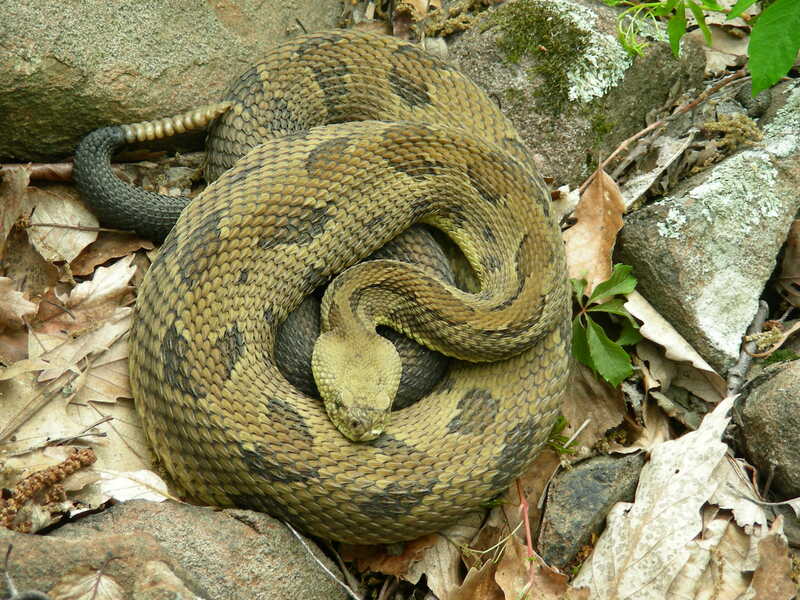 The timber rattlesnake (Crotalus horridus) was historically widespread throughout eastern North America but now persist in four New England states in small, isolated populations. The goal of this study was 1) assess the population viability of New England timber rattlesnake populations, 2), describe the population genetics structure of timber rattlesnakes in New England and provide recommendations for genetic management and monitoring, and 3) develop a standardized protocol for monitoring timber rattlesnake populations informed by model-based estimates of occupancy and abundance. Model-based estimates of population growth and PVA results suggest that populations in Vermont, New Hampshire, and Connecticut may be declining while the Berkshire Mountains metapopulation does not appear to be declining under current conditions. In all cases, population persistence was highly sensitive to survival suggesting that reducing anthropogenically-induced mortality is important for population persistence. Available data strongly suggest that some timber rattlesnake populations in New England will benefit from genetic rescue. While long generation times and logistical considerations may make genetic and phenotypic monitoring difficult, we recommend that it accompany any genetic rescue efforts. We used simulations to evaluate the use of presence-absence and count data to provide estimates of occupancy and abundance using hierarchical models and identify optimal sampling designs. We recommend that managers consider the ecology and conservation status of each population, their available financial and logistical resources, potential impacts to individual animals, and the type and quality of information provided by each method of monitoring. We suggest that radio telemetry is most appropriate for addressing specific research questions requiring detailed information on individual movements and habitat use, population-specific estimates of space use, or precise information on the presence, cause, and timing of mortality. We recommend that managers implement monitoring protocols using mark-recapture and/or gestation/shedding site occupancy and abundance. We recommend that managers maximize the number of sites to increase statistical power to detect trends in state variables but recognize that substantial limits to statistical power may occur. Pooling analyses among populations and regions may substantially increase the statistical power for detecting trends in occupancy and abundance and we encourage a collaborative approach to delineating sites and collecting and analyzing data.